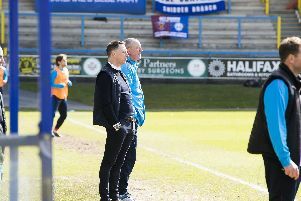 Town boss Billy Heath admitted it was a game of two halves after FC Halifax Town lost their final game of pre-season 3-0 at home to Bradford City. Town had the better of the contest in the first-half before fading badly after the interval and conceding three times. “The first-half was excellent, really good,” Heath said. “We had some decent chances, caused them problems on set-pieces and corners, but played really well in open play. “Second-half we weren’t getting hold of the ball enough, giving the ball away too much. “They upped it a little bit and the second-half was hard work for us. I think 3-0 flattered them but it was good to see how we coped when they had that rotation in midfield. “There were lots of players swapping positions so we had to be disciplined. “It was a really good run-out. “There was a good balance to us first-half. The shape was good, we worked ever so hard to close the football down and press the ball. We looked solid at the back, I think they had one real opportunity on goal, which is good against a league club like Bradford. Heath accepted that the players who came off the bench struggled to make much of an impact. “That’s what they’ve got to take on board,” he said. “When you come on you, if want to impress and try to get yourself in the team for next week, then you have to show something and express yourself. “Danny Clarke did that to a degree, lots of energy and lots of desire. On the absence of supporters at the game, Heath said: “We said to the players it was going to be a difficult situation because it was a bit surreal when you come out and you can hear a pin drop. “But we said we had to create our own atmosphere and I think we certainly did that first-half. I think we shocked them a bit how competitive we were and how much work we were putting in. On triallist Mark Ross, the Town boss said: “He did well. It’s difficult enough for a triallist but when you’;re coming on against a league team, it’s tough. “But he was solid enough. He’s got decent quality on the ball. He put in a good performance. Ross came on for right-back Cliff Moyo in the first-half, who was taken off with an ankle injury. “We’re hoping it’s more of an impact than anything else because as he’s blocked the lad, he’s fell onto his ankle,” Heath said.